Curious and passionate, Julie is always questioning how and why things are done the way that they’re done. Her innate inquisitiveness forces her to ask difficult and important questions about her clients and their business: How does this work? Can we make it better? Why should anyone care? Julie’s analytical skills help her in her day-to-day responsibilities as Account Director at Plan B – but she always remembers to also take a step back to look at the big picture. By pairing her knowledge with the ability to immerse herself in her clients’ business, Julie is able to provide fresh insights and deliver on-point strategy that strengthens brands and helps them evolve. Prior to Plan B, Julie worked at Symmetri Marketing Group and Pivot Design, gaining experience in B2B healthcare and technology marketing while meeting client needs for both traditional and digital media. 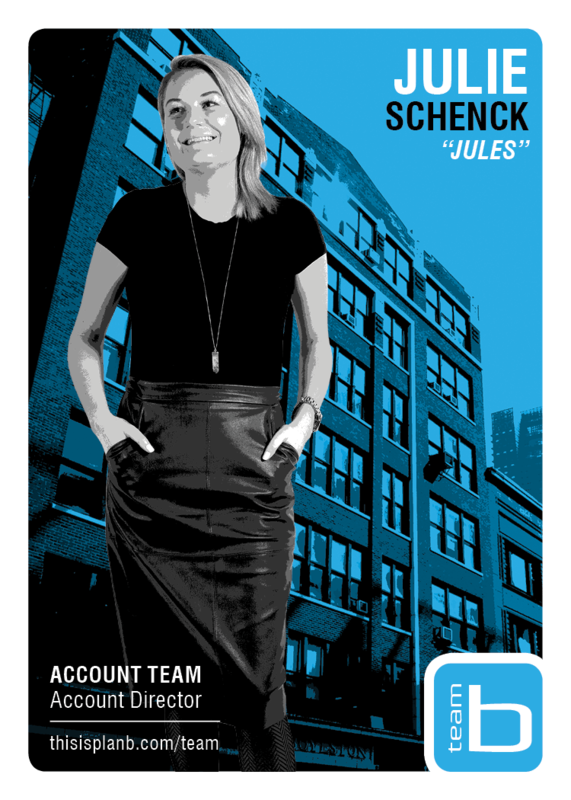 At Plan B, Julie works on our key Keiser account, with a focus on strategy development and execution for the global fitness brand. During her free time, Julie says she loves to take a book to a bar and hang out for a while. She’s been reading the same book for two years, though … so we’re a little skeptical about how often she finds time to get away.